A Casino at the Meadowlands: Is it Finally Going to Happen? 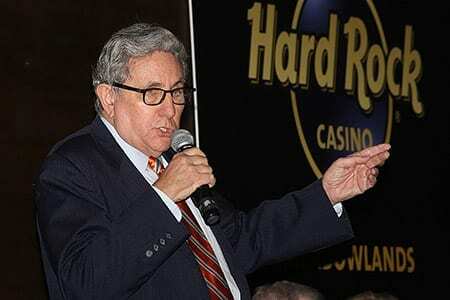 EAST RUTHERFORD, N.J.–On Wednesday, Jeff Gural unveiled his dream, a lavish casino at the Meadowlands run by the Hard Rock Company that would bring in boatloads full of money and, no doubt, revive his racetrack. Now, the question has become, can Gural and his partners turn this into a reality? What Gural and Jim Allen, the CEO of Hard Rock, hope to build is a facility that would have 5,000 slot machines, 200 table games, a New Jersey Music Hall of Fame, the mandatory restaurants and bars and, they say, bring in $400 to $500 million in annual revenue to the state. Wanting all this and getting it are two different matters, but everyone involved at Wednesday’s press conference at the racetrack expressed confidence that not only will it be done but that a casino could be open at the track within a year. State lawmakers must now work together and agree on an amendment that would allow casino gambling in the state beyond the city limits of Atlantic City. It’s a crucial step and cannot happen unless Senate President Steve Sweeney signs off on it. Long a staunch supporter of Atlantic City, Sweeney has hinted of late that he will support casino expansion in the state but has yet to come out with a firm position. That Sweeney did not attend the press conference was seen as a bad sign by some observers in attendance. Governor Chris Christie, another politician who long stood in the way of a casino at the Meadowlands, has recently come out in support of building casinos in the northern part of the state. Christie’s only concern at this point seems to be that some of the revenue from North Jersey casinos be turned over to support the ailing casinos in Atlantic City. In order to woo Christie and key South Jersey politicians, those behind the Meadowland proposal have signed off on the idea of funneling part of their profits to Atlantic City. Polling suggests that the gambling referendum would indeed pass. Gural said it’s imperative that the referendum get to the ballot this year because it will be much easier to have it approved in a year in which there is not a presidential election. In order for a referendum to appear on the November, 2015 ballot, lawmakers must come to an agreement on the language and get the referendum done quickly, perhaps as soon as within 30 days. The other key question that remains to be answered is how many casinos will be allowed outside of Atlantic City? Various politicians have talked about there being as many as three casinos, all of them fairly close together in the northern region of the state. Some say there should be only two, but the idea of allowing the Meadowlands to have a monopoly outside of Atlantic City seems to have lost all momentum. “I don’t have a problem with two. I think three is too many,” Gural said. The other proposal that seems to have meaningful support is a $4 billion project in which a casino would be built near the Liberty National Golf Club in Jersey City. However, those behind that project say it would take up to four years to build. While Gural said he would still prefer to be the only casino game in town, he may actually fare better if there is a second casino. According to sources, he has been given assurances that his tax rate will drop dramatically, from 55 to 25 percent, if he has any nearby competition. SBOANJ President Tom Luchento said he has been assured that if there are casinos in addition to the Meadowlands the others will also be required to contribute to horse racing. As far as what a casino at the Meadowlands would do for racing in New Jersey, no one has yet to come up with precise numbers, but virtually everyone agrees that it would be a tremendous boost for the sport. Gural said the goal is to have 10 percent of the revenue go toward racing, half of which would be earmarked for thoroughbred racing. He projected that $40 million would be available for purses, $20 million for each breed. With $20 million added to the purse accounts, purses at the Meadowlands would more than double. Luchento and Gural have long been allies in the battle to bring a casino to the Meadowlands, but one thing they figure to spar over, if there is expanded gaming, is the amount of racing dates. The Meadowlands currently runs only 81 cards a year and Gural said Wednesday he does not see a major expansion in that area. The dates question doesn’t figure to be the only contentious issue. Who will get what when it comes to dividing up the money will also be hotly debated. One thing that is clear is that there will be a lot of slices to the pie as those in line for a piece include the state, the track operator, the casino operator, the thoroughbreds, Atlantic City, the sire stakes, Freehold and, perhaps, others. “Everybody is going to have their hand out,” Luchento said. “Yes, that is a concern. Everyone is arguing now over how much they’re going to get and we don’t even know how much is involved. It will have to be ironed out.